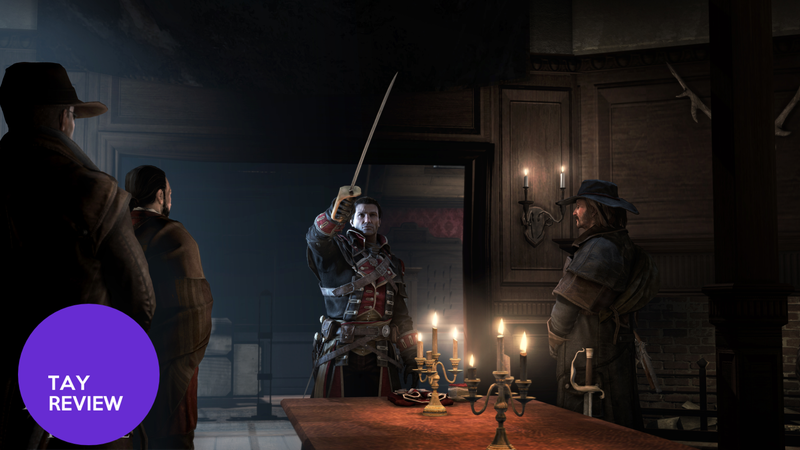 Assassin's Creed Rogue is the game you weren't supposed to like as much as Unity. It's probably the final last-gen game the series will see. It's also the best story the series has ever told. Ubisoft Sofia, the studio responsible for Assassin's Creed: Liberation, created their first console title in Rogue. The game feels like it falls between a portable and a proper AAA Assassin's Creed title in some respects, but the result is an undeniably good game. Rogue follows the life of Assassin-turned-Templar Shay Patrick Cormac through his conflict with The Assassin Brotherhood. Throughout the 10-15 hour story, it's easy to see Shay is conflicted by his own choices and the consequences they carry. Hunting Assassins is not something Shay seems to particularly enjoy, he recognizes his betrayal of the Brotherhood's trust and struggles with it. As a result Shay feels more human than previous protagonists in the series and makes the Templars seem as though they're not all that bad. The writers at Ubisoft Sofia did a fantastic job of not painting the Templars or Shay as the bad guy, even if the series has taught us that's exactly what they are. In fact, at some points in the story, the Templars seemed like they were the ones doing the right thing. Unlike its prettier sibling, Rogue also contains some modern-day elements. They're basically the same stuff we saw in Black Flag a year ago, but they're still fairly likable. The extent of what you do in the real world is walk around Abstergo Entertainment in first person and fix computers. Of course, fixing computers reveals relevant bits of the story by way of voice memos and intercepted emails. There are some gems there, but it's mostly a way to unlock more of Shay's memories and get you back into the animus. But hey, something's better than nothing. From a technical perspective, Black Flag is the best game the series has seen. Combat was fluid and worked (mostly) well, the lack of proper stealth was made up for with environments that allowed ample room for hiding, and the game perfected Assassin's Creed III's naval battles, which were loved by many. It should be considered fortunate, then, that Rogue borrows very heavily from Black Flag in all things gameplay. In fact, Rogue really only boasts two or three new additions to the Assassin's Creed formula. The first is Shay's air rifle— a gun that shoots darts and later grenades which can be used to either distract or kill enemies. The rifle turned out to be my most used item in the game, next to my hidden blade, something I didn't expect. Rogue's second new contribution to the series is the stupidly-named-but-still-pretty-cool-in-practice Danger Compass. As a turncoat, Shay is constantly hunted by the assassins. As you parkour your way through the game's locales, you'll often hear whispering which will grow louder, once this happens, switching to Eagle Vision will show a circular icon (pictured above) when it's full, it means an assassin is nearby, lying in wait to end you. Finding your hunters and knowing they could be anywhere is sort of a game unto itself. And though it can be annoying at times; assassins can pop out, say, in the middle of a pursuit and kill you, having to constantly be vigilant against an assassin attack that could come at any moment added a very welcome sense of tension to the game. Rogue's final new addition is a gas mask for Shay, which feels, well, useless. when I tried to use it it often didn't work. In fact, Shay's gas mask was seldom necessary, to the point that it felt like it only existed to reuse some of Black Flag's animations. New additions aside, Rogue has everything you saw in Black Flag, dual swords, dual pistols, you name it. If you liked playing Black Flag, you'll equally enjoy Rogue. Black Flag's naval battles are back in Rogue as well. Though you're a Templar instead of a pirate, you'll have plenty of occasion to take to the seas and blast opposing ships. Required battles aside, you'll also have the opportunity to hunt big ships across the North Atlantic. Naval battles were great in Black Flag, and they're largely unchanged here. Blowing your enemies out of the water is still satisfying, but some of the magic has worn off. Rogue's seafaring segments feel tacked on and unnecessary, as if the game would have felt better without them. It's no secret that Rogue just isn't going to look as good as its new-gen sibling, Unity. For a last-gen title, Assassin's Creed Rogue is pretty, but we've all moved on. I never found myself particularly impressed with what I was seeing on screen, save for one thing— Rogue's water. The seas are gorgeous. In fact, water is the one thing that looks better in Rogue than it does in Unity. Given that Rogue is running on nine-year-old hardware, it's impressive it looks as good as it does. I get that lots of people loved the fact that you could be on a boat in Black Flag. Some even wanted Ubisoft to make a whole new game out of the component on its own. Well, Ubisoft Sofia must have taken that to heart, as just about every mission it seems has you getting on your ship and traveling somewhere. Personally, traveling by sea was one of the things that I like least about Black Flag. Traveling from port to port just feels tedious. In fact, some missions litreally just required me to sail to a new location and complete a mundane objective, just to start off the next mission back in my ship to repeat. I probably abused Rogue's fast travel feature, but it was better than having to sail more than I had to. There's no nice way to say this— most of Assassin's Creed Rogue's voice acting is bad. Lines are poorly delivered, they don't seem to fit the context of the scene. Some characters jarringly change intonation inexplicably in the middle of a conversation. Characters sound wooden, or emotionless. It's a shame too, as their poor performances drag down the excellent story. Steven Piovesan delivered a decent performance as Shay, but it's hard to appreciate his performance when the other actors are beating their lines to death. Assassin's Creed Rogue is like an amalgamation of all the games that came before it. From gameplay to animations to the world itself, everything is borrowed from a previous entry. You'll see locales from Assassin's Creed III and Black Flag comprising the entirety of your game map, the real world is Abstergo Entertainment, lifted completely from Black Flag. Shay's animations are all Edward Kenway's from Black Flag as well. In fact, when you enter an enemy area, Shay will pantomime putting a hood over his head. It's supposed to be his gas mask, I believe, but the likeliest scenario is the developers didn't want to have to remove coding that triggered that animation in the game engine. The end result is a game that feels like very little original content was created for it. It's less like you're playing a brand new game and more like you're playing through an amazingly good mod. Before it released, many gamers dismissed Assassin's Creed Rogue as an afterthought; scraps being thrown to last-gen loyalists for making the franchise the success it is today. Fortunately, that wasn't the case at all. Rogue takes the formula of one of the best Assassin's Creed games ever made, and combines it with the best story ever written in the series for a product that is something unique and engaging. Assassin's Creed Rogue isn't my favorite title in the series, I still prefer Unity; but it is a perfect compliment to this year's new-gen outing. Ubisoft Sofia, who until now was known for portable AC titles and ports has shown they have the chops to make great games for the big screen. If you like Black Flag, or the Assassin's Creed series in general, do yourself a favor and play Rogue.